In the 50’s there was a rearmament and shift back toward conventional forces, recognizing the limits of the nuclear strategy. The early 60’s was the same with investments replacing some real losses and as many bombs as dropper in WW II. The euphemism “defense” went out in 1991 when the Soviet threat evaporated. What occurred despite a respite under Bush/Clinton is that war state mis-investments did not grow with total economy investments. DoD crowds out too much R&D (about 100B) and heavy industry (about $104B) in real terms even though in percentage the wastage and fraud seems less. In the 50’s there was Korea, and surprised rearmament with a shift back toward conventional forces, recognizing the limits of the nuclear strategy. The early 60’s was the same with investments replacing some real large losses in airplanes and helocopters and as many bombs as dropped in WW II. What occurred despite a respite under Bush/Clinton is that war state mis-investments did not grow with total the economy’s investments. Now the pentagon flacks crowd out too much R&D (about $100B/annum) and heavy industry (about $140B/annum) in real terms about as much as 1968 even though in percentage the wastage and fraud seem lower. Along the line as ilsm but in another direction entirely. I don’t understand the “crowding out” argument based on what we have seen. If resources were needed in the private sector to the extent that we must sacrifice the health of the US, then I don’t understand why a “speculative bubble” could ever exist since there would be no excess private money to speculate with. It would be busy investing and meeting demand. Which brings me to another thing I don’t understand. Where is the demand? It seems to me that the current demand is for jobs and if the private sector is not meeting the demand, where it is, then I think the money is better put in the public sector to target job creation where the US actually is benefited. Right now it seems that the private sector has been crowding out the future of this nation. P.S. I ask simplistic and sometimes ignorant questions because I am the resident non-economist. While I agree with much of what you say I think I disagree with the non-specificity of your statements. You say that the cold war is over and point to BushI/Clinton days but you don’t mention one of the major policy changes which falls under “industrial partners”, “commercial off the shelf”, “lead system integration”, etc. None of the shifts, some just emphasis, were bad. But when industry becomes dependent for growth on the size of the budget, there is a problem. When R&D funding organizations are required to fund more applied and targeted (e.g. DOD issues) areas, innovation and basic research suffers. When academics lobby congress to preempt the peer review process and funds are needed for a carve-out per congress critter, the future suffers. When leaders (e.g. DOD) need to be making the plan modifications to adjust to today’s needs, they are required to entertain vendors and often get their ideas from the vendors who have vested interest in plans not changing. Also, a “professional” army requires enough high level slots to produce the reward of the model, thus acquisition professional military, etc. I guess what I am thinking is that along with the large program waste there are a lot of problems that permeate programs even if they are not submarines and aircraft. Requirements seem to never come out of the book even if they no longer have much to do with today’s need. New requirements become fad-of-the-day (e.g. terrorism). What do you say if I say that I think the biggest problem is the lack of sanity in planning for the DOD? You may be looking at the wrong plan. I’d bet the profits are meeting or exceeding expectations even if nothing else is. Fiction, DoD planning is not connected to any real threats. That is the problem. The force structure needs to be reduced, and the high tech solutions curbed, because there is no need for the structure or the capital intense solutions to cover made up “capability gaps”. I try not to be too in depth. LSI, COTS, PBL/Partnering are all fictions to keep the industry profitable. Even though it is not needed. I have been considering writing a post arguing against Milton Friedman about draftees not being “slaves” and that continuously expanding supplies of money should not be the prime reason men and women become soldiers, but I have not gotten there yet. Vietnam was my generation’s war even though I did not get there. There is very little reason for a “professional army”. Finally, R&D funds come in 7 or 8 levels. 01 is basic research usually done at a university basic science. The numbers go up. The problem I see with DoD R&D is the largest percentage is in engineering and manufacturing development, continuously overrunning and a lot of waste. To get things like the F-35 done while it has not enough R&D funding to do design tests, which cannot fail anyway. I try not to get too in depth because it is really wonkish. There is very little reason for a “professional army”. Other than justify a capital intense military to keep the industry healthy. When a defense contract gets to overrunning and the profit margin declines the work becomes “out of scope” and they basically stop. If the legal side cannot accomodate that the contractor stops and sends in requests for equitable adjustment (REA, we do so many they have an acronym) to make profit on their “do-overs”. Those are a pain and take time getting nothing done worth the taxpayers’ dough. Then Sr managers, the really high ranking ones need to get involved to fix the contracts and add scope, which means paying the overruns with margins like they were performing or something. Some of us had to be “managed” to do those kinds of things. That is why they pay lip service to whistleblower laws but no one is protected. 1) Why is the left axis a % of total investment? This is just measuring the components of the total investment. The left axis should be it be an absolute number, or a % of GDP if you are trying to measure crowding out. This graph shows nothing. 2) If investment dollars are at least somewhat finite, are we to believe that the governement borrowing $14T, or nearly 100% of GDP, from investors does NOT crowd out any private investment? 1: I really don’t understand. It seems that shares is exactly what you want to look at if you’re measuring crowding out. In any case, the picture for % of GDP is basically the same. 2: You need to read Randall Wray. that borrowing 100% of GDP didn’t happen all at once. but i agree with you that the left axis is a bit obscure. i am not sure that government “investment” and not government “spending” is not the metric that the argument is about. of course i would argue that all government spending is investment… in priniciple.. in the sense that “investing” in a strong country brings returns that are a little hard to measure on a balance sheet, but hard to deny if you are not ideologically committed to blindness. investment dollars are NOT finite. that’s the whole point. at any given time there is a trade off between “investment” and “consumption.” but in the first place the only reason for investment is to increase the consumption potential, and in the second place, if successful, the investment compounds. you are neither simplistic nor ignorant. sometimes the learned experts are both. not being particularly mean to our economist friends here, but people can (and do) learn so much from a book that they never take the time to look at the world. 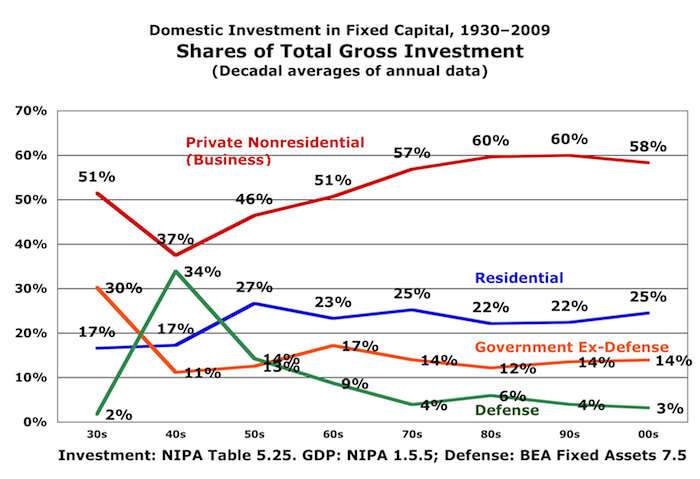 Then you provide data only on government INVESTMENT (not total government SPENDING) in relation to private investment. Very little governmental spending is categorized as “investment” and it is the government spending that is NOT categorized as investment that stands accused of crowding out. I’m not saying you are wrong, but you need to provide a different set of data to support your conclusion. If a previous level of X was good, why don’t we double or triple the level…that would be even even better, correct? Why not take the argument ad infinitum, ad absurdum and take it to 100%? Exactly, because at some level it does matter…now that we have that out of the way. what level is that? what level do you postulate that is? Sammy, did you read the post? There’s a link: government consumption spending has been flat since the seventies. What’s grown is SS and Medicare. Yes, those have crowded out private financial services, for pensions and medical insurance. Certainly in the case of Medicare, they have also done the job far more efficiently than the private sector — 3% in costs compared to 16% plus. But the other hysteria is just that. If you are trying to analyze the relationship between Government Spending/Private Investment, I still do not understand how the ratio of Private Investment/Total Investment is useful. It is possible that this is a mental block on my part. Investors currently hold $14T in Government debt. Suppose the US won an Intergalactic Lottery and was able to pay off all those bond holders, forcing them to reinvest. What would happen? Most likely those investors would seek out other highly rated investments, such as AAA Corporate Bonds. The increased supply of capital would lower the yeild on those bonds, which would lower the cost of capital for those companies, making more potential investments pencil. In addition, as the yeild on highly rated bonds decline, some investors will seek higher returns from lower rated bonds, say AA or A, causing the same thing to happen until the entire $14T gets absorbed as reduced cost private investment capital. This is “crowding out’ theory. i am kind of on your side with respect to steve’s graph.. at least i think he needs to make his case clearer… and for the record SS did not crowd out any private insurance or retirement. the private market was simply not filling those needs. but with interest rates where they are today, your crowding out argument doesn’t seem very realistic either. would getting people to pay enough taxes to reduce the debt count as winning the intergalactic lottery? Sammy, you’re assuming that the quantity of money is fixed. The Fed and the banks created that new money by issuing credit. If Treasury taxed enough (there is no intergalactic source) to buy back all the bonds, that money simply wouldn’t exist anymore. Again, you need to read Randall Wray. I usually disagree with sammy. and even here i disagree with his bottom line. But you need to explain yourself better. and saying “you need to read…” is not a good explanation. since you have read Randall Wray, you need to explain what he said that you say is so convincing in at least enough detail to convince us it’s worth reading. There is something a little fishy looking about “percent of investment.” and while “spending is constant” may explain that, you need to fill in the details to be convincing. the “quantity of money” argument at least superficially works against you as much as it does against sammy. maybe, for all i know, the poor private investors are able to keep private investment at 60% of “total investment,” but if “government spending” were lower, they would have more actual money to invest in great enterprises. I don’t think that’s true, but you haven’t shown it. >if “government spending” were lower, they would have more actual money to invest in great enterprises. I can’t figure how I could prove or disprove this counterfactual. I’m really sorry I just don’t have time at the moment to explain Modern Monetary Theory/(neo)chartalism/whatever you want to call it. . I think I am on your side, but it seems to me that if you want to make a point you have the burden to explain it adequately. And not time to explain modern monetary theory is just a stupid an argument as Rwe’s telling me on another thread that I just don’t understand investment. but i don’t have time to explain logic theory to you. well if you come back in the door, remember i think you are probably right. just trying, as i sometimes do, do force the good guys to work a little harder at being convincing. The crowding out argument seems to fail on its face. Government spending is some entity’s income. it is no different than the spending of the public or between private organizations. Spending is income on the other side of the “deal, so to speak. What the recipient of government spending then does with their income has little to do with the derivation of that income. More likely executive compensation is crowding out corporate investments as it comes right out of the income stream. The same can be said on dividend distributions. Pay dividends and have less to invest. What is the big mystery? If the government doesn’t get a share of the GDP how is it to operate? Argue all you want about the wisdom of this or that government expense, but don’t deny that when the government spends the money someone else gets that as income, and that someone is most often some contractor or producer at some point in the business chain. Plausible. However, maybe we are not measuring the right thing. For instance, drinking too much water will kill a human being. How much water is too much? That is the wrong question. There are other factors at play. Not that I know what they are, but enough water to kill an infant is unlikely to kill an adult. Surely age, size, and general health matter. i think you are right. what i was hoping for from Roth was a complete debunking of the whole crowding out argument. it seems pretty clear to me you are not crowding much out with an interest rate below the rate of inflation. or incomes at the higher levels of half the GDP. incomes that are not “taxed away” however they bleat. how can we arrange fir crowding out spending on middle-east adventurism and the many useless, though quite glamorous, military hardware stuff. I’d also go for crowding out any expenditures by the Federal government on states with Tea Bagger representatives over and above the level of taxes collected from those states. In fact I’d like to see a constitutional amendment prohibiting the federal government from sending more funds than are received from any state as tax revenue within each state. That’s a clumsy sentence, but basically it means, don’t send them any more than they collect and send to Washington. From each state according to its ability and then spend it in each state according to what was sent. Starve the scum that think that want to shrink their government so that they begin to understand that most of them are receiving far more than they contribute. well, there’s always the Robespierre plan. but you know i think that good things have come to bad ends before this. we may need to recognize the nature of the game we are in. and if the only way to tame the wild animals is to wave red meat before their eyes, we need to become better at red meat waving than they are. otherwise we are going to have to live in their circus and dance in their rings. me, i’m feeling like the hopi. just gonna live in the desert and wait them out. they can’t last more than a couplehundred years. Some of the fools are suddenly beginning to understand that their favorite Representatives on the far right side of the ideological aisle are looking to take away their health care and retirement safety nets. I’m hoping that Reid does bring the Ryan/Republican budget plan to a vote in the Senate so that they can all go on record as wanting to sacrifice Medicare for the elderly and Medicaid for the poor in order to reduce yet further the taxes of the wealthiest Americans. Ryan had a couple of interesting chit chats at his last couple of town hall meetings.